Alcon provides braking solutions for the top echelons of motorsport. 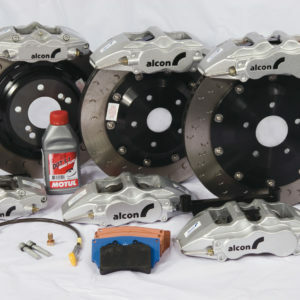 Alcon is one of the world’s foremost manufacturers of performance and motorsport brake and clutch systems; supplying and winning in F1, WRC, NASCAR, Indy Car, Touring Cars and GT racing, as well as engineering extreme solutions for several leading performance road car manufacturers. Alcon’s has a huge range of brake and clutch products which has been honed over 30 years of working at the top level of motorsport – from Audi Quattro Group B cars to the futuristic Formula E. Alcon also supply solutions to some of the world’s most prestigious marques, including Audi, Bentley, Brabus and Jaguar Land Rover. Their products are found in some of the most extreme applications such as the 900bhp/ tonne Ariel Atom 500 and the 225mph Noble M600. On the road Alcon’s racing and OEM expertise is also available to owners upgrading their street cars for enhanced performance on road or track. Alcon Advantage Extreme brake kits and upgraded clutches give those wanting top performance the edge, with race options available for the serious petrol head. With a wealth of experience in brake and clutch design, backed by their well-equipped development facility, Alcon thrives on the challenge of devising innovative and unusual solutions for every application. Interex are distributors for the full Alcon braking product range. If you require any product information or pricing then please contact us using the information below.